The Advantage of Totally Laparoscopic Total Gastrectomy (tltg), Less Invasiveness, Application Easiness and Cost Effectiveness : in a Single-institution Experience of Over 140 Cases. 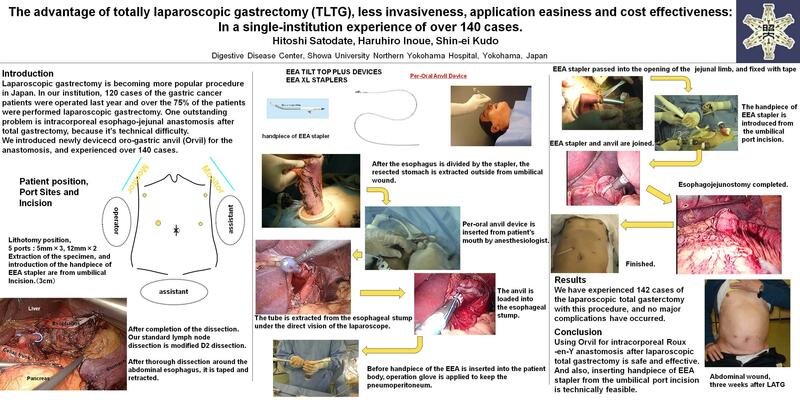 Although laparoscopy-assisted distal gastrectomy for gastric cancer is becoming popular procedure especially in Japan and Korea, laparoscopy-assisted total gastrectomy is less common operative procedure. One of the major problems is difficulty of intracorporeal reconstruction, especially intracorporeal esophagojejunostomy. And another problem is cost. Some article reported laparoscopy-assisted gastrectomy was associated with decreased hospital profit, due to much use of the disposable instruments. We developed TLTG procedures that requirement of disposable instruments is minimal, within the coverage of Japanese insurance system. A 12-mm trocar is placed through umbilical incision, and four additional trocars are placed. Only two 12-mm trocar incisions and three 5-mm trocar incisions, including for the camera, are created for this procedure. After thorough mobilization of the abdominal esophagus, the esophagus is divided with stapler, and Orvil is inserted per orally, and the anvil is loaded into the esophageal stump. Then the handpiece of EEA stapler is introduced from the umbilical port incision, and the jejunojejunal anastomosis is also created from the umbilical port incision. We have performed 142 cases of the TLTG with this procedure, and have experienced only one minor anastomotic leakage. No other major problems had occurred. Mean operation time is 230 min. And the mean time for the whole procedures for reconstruction including creation of Roux-en-Y jejunojejunal anastomosis is 54 min. Two clear advantages can be mentioned with this method, compare with other techniques. First, this technique can be relatively easily applied for the cancer of the cardia. Second, minimize the use of disposable instruments. Only two linear staplers and one circular stapler are needed, and these are completely covered by insurance. This technique could become the standard methods for reconstruction after TLTG, and facilitate the acceptance of TLTG. And also lead to the hospital benefit. We will show our clinical practice.